Swooping arms of clear crystal give this large black chandelier with LED lighted canopy undeniable glamour. Eight slender candelabra fixtures adorn this graceful large black chandelier. Every detail is pleasing to the eye, from the clear crystal contoured arms to the chrome finish supports that complement the frame. Black silk shades top each of the lights, and crystal drops provide further decoration. A dramatic look with tons of glamour from Vienna Full Spectrum™. Comes complete with a non-lighted chandelier canopy and an LED lighted canopy for an added glow. The brushed nickel finish lighted canopy includes a transformer and warm white LED strip rated at 2700K-3500K color temperature. Derry Street chandelier with LED lighted canopy. Clear crystal arms and drops. 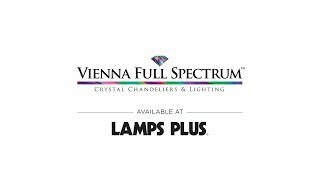 From the Vienna Full Spectrum collection of crystal lighting. Eight maximum 40 watt or equivalent candelabra bulbs (not included). Measures 32" wide, 29" high. Includes 8 feet chain and 9 feet wire. Includes chandelier canopy and LED lighted canopy. Chandelier canopy is 5" wide. Brushed nickel LED canopy is 10" wide, 2" high. Hang weight is 38 pounds. SAW IT IN THE STORE AND LOVED IT!!!! Can the chandelier be used without shades? What does the “candle base look like? Also does the slceiling plate have to illuminate or can that be turned off? BEST ANSWER: Yes - you can remove the shades and you will have the bulbs exposed with the silver candle covers. I have added the version without the LED canopy below. Do the shades just clip on so that I could change them? Love this chandelier, but don't want black. BEST ANSWER: The shades use a UNO fitter. However, the shades can easily be removed and regular clip-on shades could be used. Click on the link below to browse our selection of clip on chandelier shades! It is an absolutely gorgeous chandelier!